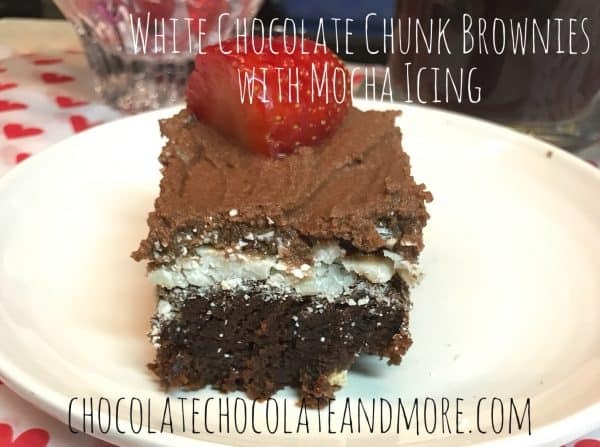 White Chocolate Chunk Brownies with Mocha Icing - Chocolate Chocolate and More! These white chocolate chunk brownies remind me a little of a mochaccino – dark chocolate brownies, creamy white chocolate and mocha frosting. Best of all, they take less than an hour to make. I grew up on boxed brownie mix. For a long time, they were my “go to” take-along for pot-luck dinners. Brownie mixes have gotten more diverse in recent years — but even those options are usually only “with nuts”, “with caramel” or “with more chocolate to make them gooey”. If you have some white chocolate and a way to make coffee, you have all you need to take that basic box and make it into a treat to wow your friends. To get started, just read the instructions on the box of mix; however, instead of water, add coffee (and any flavor will do — I just wouldn’t use too dark of a brew or else it might end up being a little bitter). I broke half a bar of baking chocolate into small pieces and added them to the mix. I used baking chocolate because it won’t melt and be absorbed into your brownies like smaller chips would be. I put the brownie mixture into an 8″ x 8″ baking pan, and baked as instructed on the box. Make sure you use a toothpick to test whether the brownies are done before you remove them from the oven. While the brownies are still hot, top them with the white chocolate chips. Cover the pan and allow the chips to melt, about 5-10 minutes. Once the chips are completely soft, use a spatula or knife to spread the melted chocolate across the top of the brownies. You can decorate the top with strawberries, raspberries, or if you really want to be fancy, use some pink frosting to make a heart or to write a little love note to your sweetheart. I cut my finished white chocolate chunk brownies into squares. Then I set up a selection of coffees from Gourmesso Coffee so that my friends could pick what flavor of coffee they wanted to drink with their brownies, and boom, happy faces all around! Preheat oven according to directions on the box of brownie mix. Prepare mix according to instructions on box. Replace water in mix with equivalent amount of cold coffee (usually around 3 tbsp). Add white chocolate chunks and combine. Pour batter into 8" x 8" pan and spread until evenly dispersed across the pan. Bake brownies according to box instructions, or until a toothpick inserted into the center of the brownies comes out clean. Remove brownies from oven, and top evenly with white chocolate chips. Cover and set aside for approximately 10 minutes, allowing chips to melt. Once chips are melted, spread across top of brownies and set aside to let cool. Combine confectioners sugar, cocoa powder and corn starch. Mix until combined into an smooth icing (add more coffee or sugar depending on if you feel mixture is too wet or dry). Spread icing on top of cooled white chocolate chip layer. Decorate with berries, candy, or serve as is! 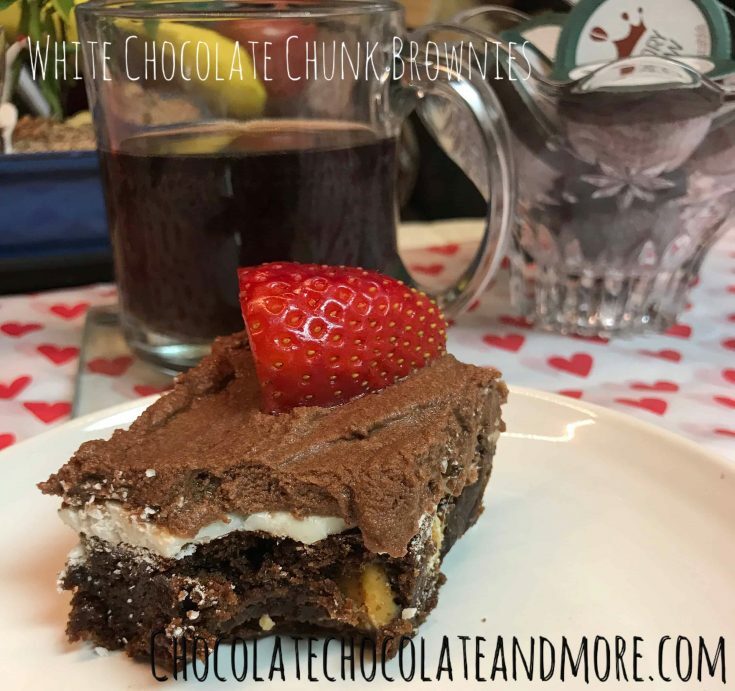 If this recipe sounds good to you, you might also like to give our Mocha Fudge Cake or White Chocolate Macadamia Nut Cookies a try, or this Chocolate Cheesecake Dip from our friends at Cravings of a Lunatic. All go great with a cup of hot coffee — or a big glass of milk! Mmm this appearance delicous! i like brownies and this brownie sounds even as smart. Brownies are always a winner at our house. I love the idea of using coffee in brownies. These look delicious. I’m going to try this recipe for some friends visiting tomorrow. 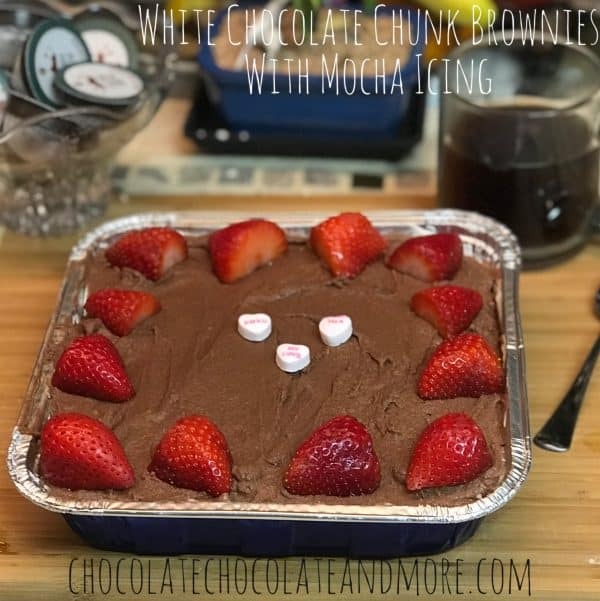 The recipe I clicked on was Chocalte Mousse Cake, but the recipe that keeps showing is White Chocolate Chunk Brownies with Mocha Icing. Hi Krista, is this what you’re looking for? https://chocolatechocolateandmore.com/chocolate-mousse-cake/ Sorry for the inconvenience.